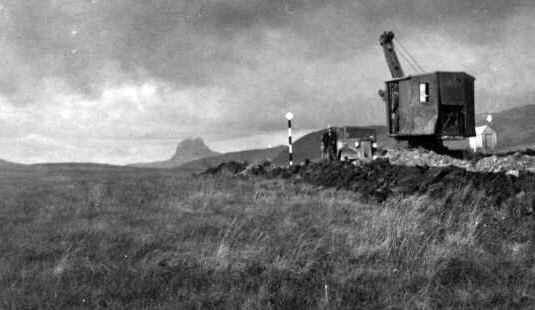 Black and white photo of a road crossing moorland with roadworks in progress. On the right is a small wooden (workmen's?) shed and a grading machine(?) with piles of rubble in front of it. A man holding a shovel is standing beside a car parked in a passing place. Suilven is visible in the distance. Taken by Miss Lyon.